Countless Tuscan elements: terracotta pot with sunflowers, straw bottles of Chianti, gregarious Florentine gentlemen, lots of prosciutto, and locally crafted pottery. Alla Vecchia Bettola’s ‘alla vecchia bettola’ recipe is famous the world ever. Hundreds of Italian restaurants and chefs have recreated this renowned dish in various ways, from East Hampton’s iconic Nick and Toni’s to Ina Garten to amateur me. 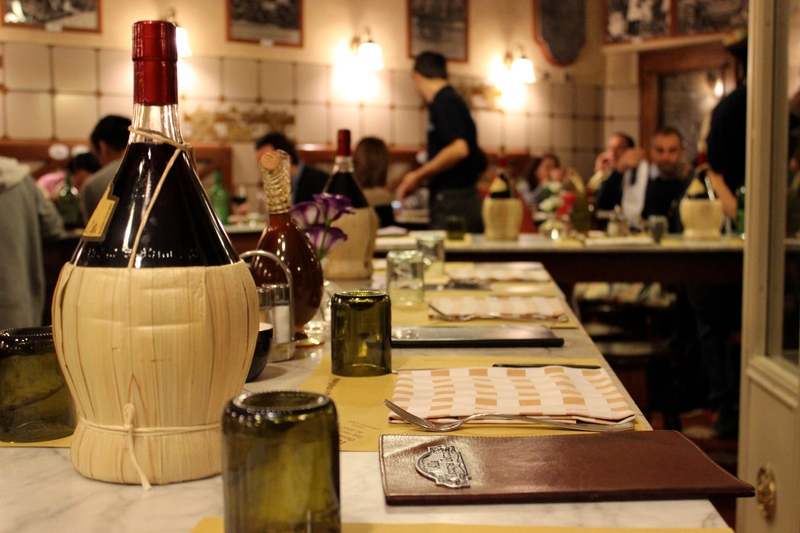 However close the duplication, no experience quite compares to the original, served to you by gregarious Fiorentini men, surrounded by other boisterous Fiorentini sitting on wooden stools, bottles of Chianti in their straw holders and decorum reminiscent of an ancient osteria. 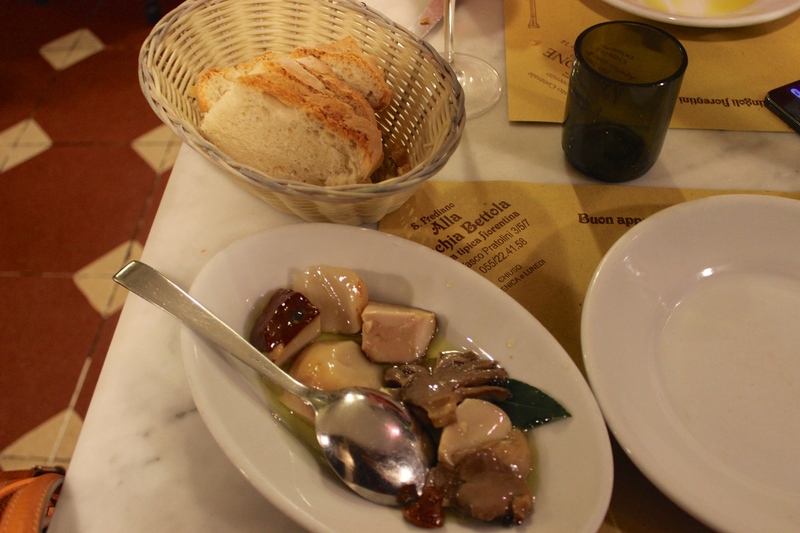 The local favorite has been serving classic Florentine dishes since 1979, and night after night the osteria is filled to brimming with Fiorentini who know they can rely on Bettola for honest, quality Tuscan cooking. Upon entering, I feel as if I am stepping into a party at an Italian friend’s house. Patrons are joking around with the owners and staff, the staff are joking around with each other, and the diners are tucking into the centerpieces on the table: thick wooden cutting boards leaden with steaks cooked over a grill, certamente. As the gentlemen bounce from the kitchen to the prosciutto behind the bar, to the wine, to new guests entering at the front door, we get cozy with those sitting next to us. At our communal table, a Polish couple is on their yearly pilgrimage to their proclaimed favorite restaurant in the world. 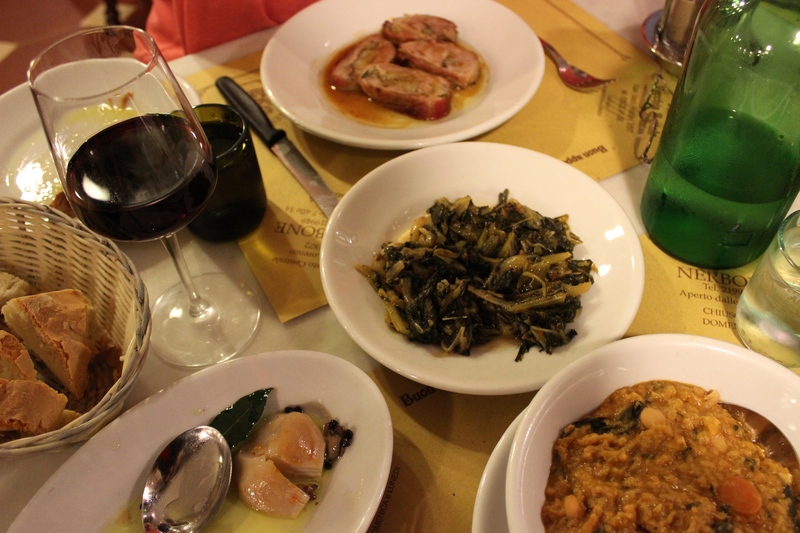 They visit Alla Vecchia Bettola every year, sometimes finishing two or three bowls of the famous penne between them, in addition to the classic bistecca and other favorites. 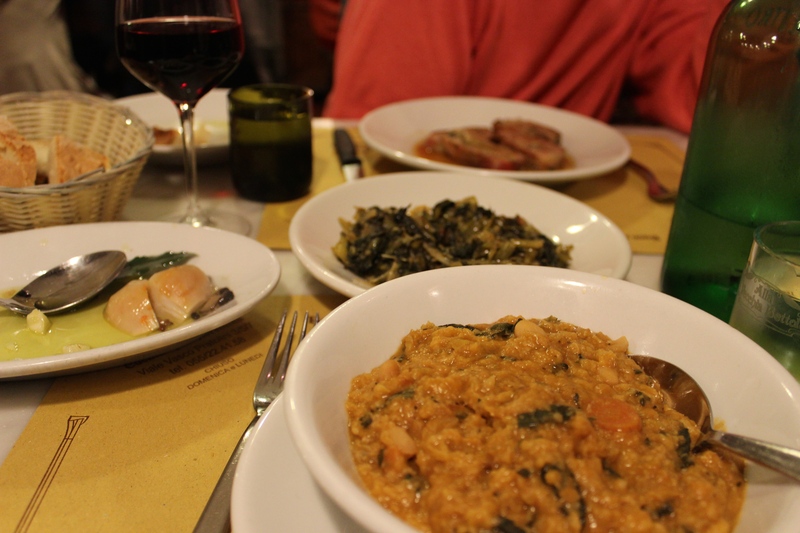 On the other side of them, a Florentine gentleman has brought two American friends to dine at his personal favorite neighborhood restaurant, even though this is their second night in a row at Bettola. No matter, they happily dig into more of that famous penne. We oblige willingly. The penne is smooth, the sauce is the perfect consistency, and with a hint of spice and fresh parsley, it is one of those incredible simple dishes that feel like magic. It really is as good as everyone says, and I get the sense that I am watching a video on fast forward as the oval bowl becomes empty save for a coating of sauce. November means porcini mushrooms, simply dressed in olive oil, and the first hints of cold weather call for Tuscan bread and vegetable soup: this ribollita is the best I’ve ever had. It is thick and filling, and I kill two birds with one stone by dining on seasonal vegetables and country bread in one dish. The lamb, rolled and roasted with artichokes, salt, pepper, and olio, is the stand-out: it is the most tender, most flavorful lamb I can remember, and the artichoke gives the plate a dash of color. Spinach with whole garlic cloves and hot spice is another simply dressed side. The food is as flavorful as the ambience is fun and lively. As the evening progresses, the festiveness increases. More and more Fiorentini have arrived, as they prefer to eat later than us Americans. I think this is one of the most jovial, lyrical places one could find in Florence or elsewhere, and I understand why it remains as popular today as it was in 1979. The concept is so simple it is genius, a scenario that has led to a worldwide love affair with Tuscany. 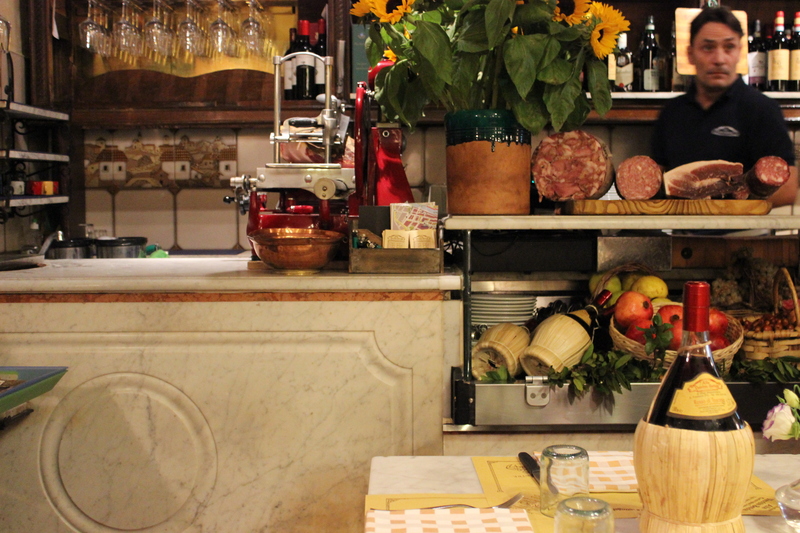 The decor is Toscana in a snapshot: terra-cotta pots, handmade ceramics, giant sunflowers, a Berkel prosciutto slicer, marble tables, bottles of Chianti in fiasco (straw basket), and menus bound with Florentine leather. 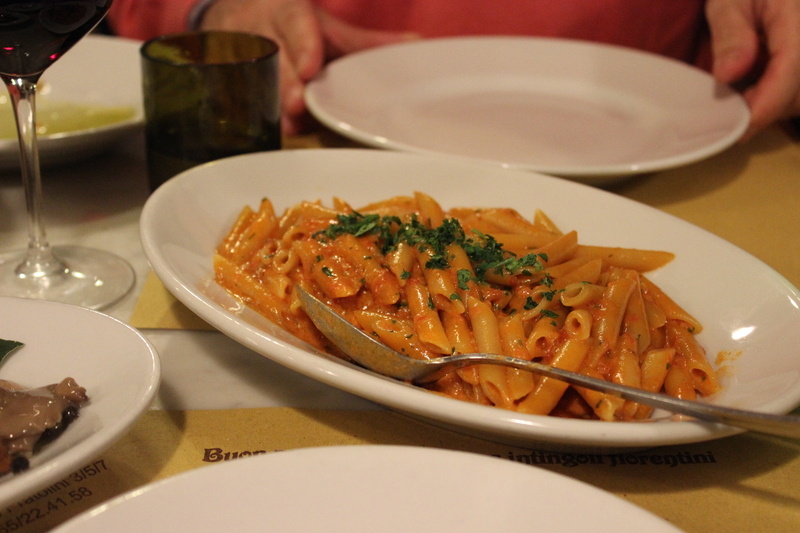 The family-run restaurant employs a staff with barely any turn-over, meaning that the same affable man who served your penne in 1985 is likely the same who serves it today. The personality is bursting, the laughter is contagious, the smiles are effusive. The dishes are made with the highest quality ingredients, each used only at the height of the season, as Florentines prefer. 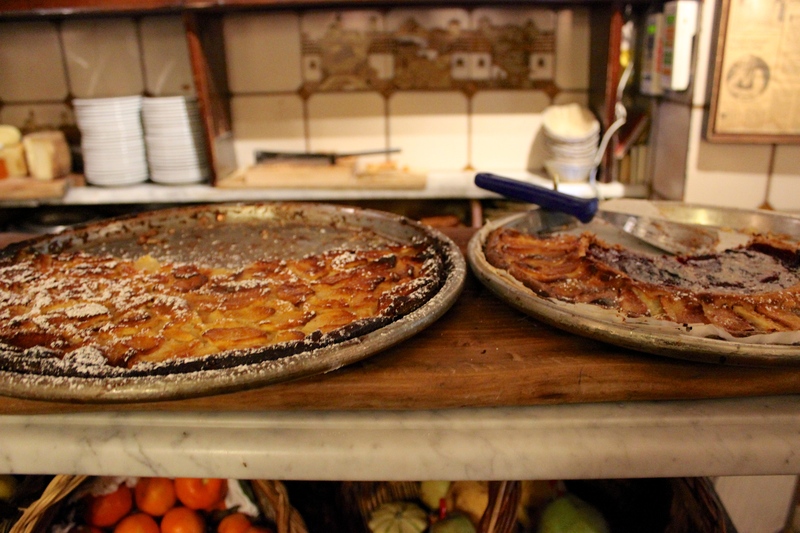 It is Florentine cooking as the owners remember it from their childhood. In fact, this genius concept is such an unassuming success, that the owners’ sons have capitalized on the idea by opening ‘da Nerbone,’ now another humble, smashing success located in the Mercato Centrale. (The family also owns Nerbone in Greve.) 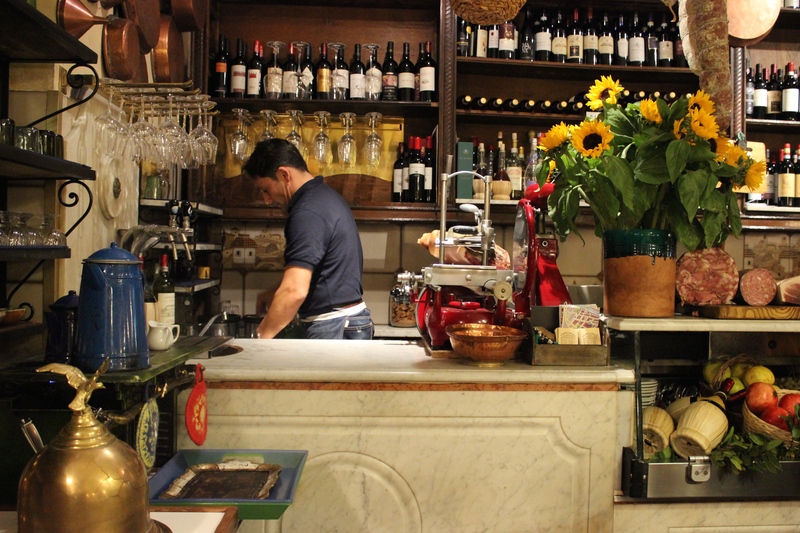 A simple takeaway bar in the local market is written up in international magazines and newspapers more often than any overpriced copycat of the famous alla vecchia bettola that you might find at a faux Italian restaurant stateside. 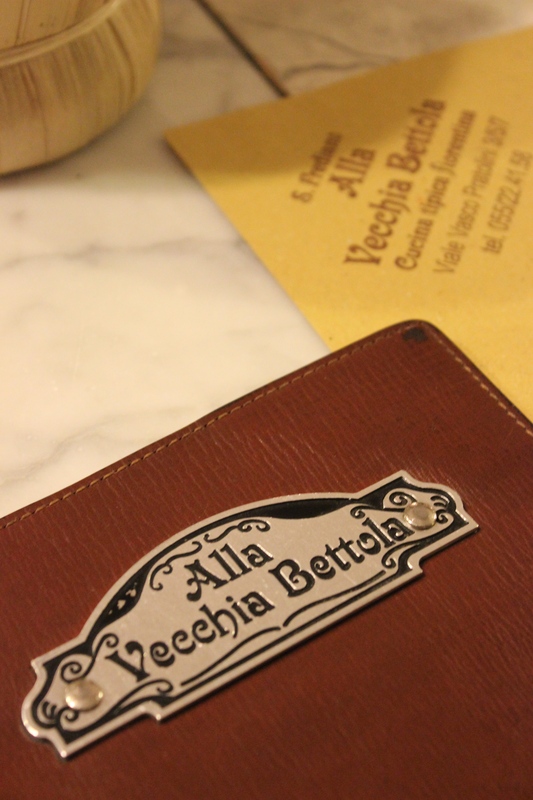 Try as they might to duplicate a recipe, no chef can duplicate the sensation of dining at the original Alla Vecchia Bettola. Lamb rolled and roasted with carciofi. 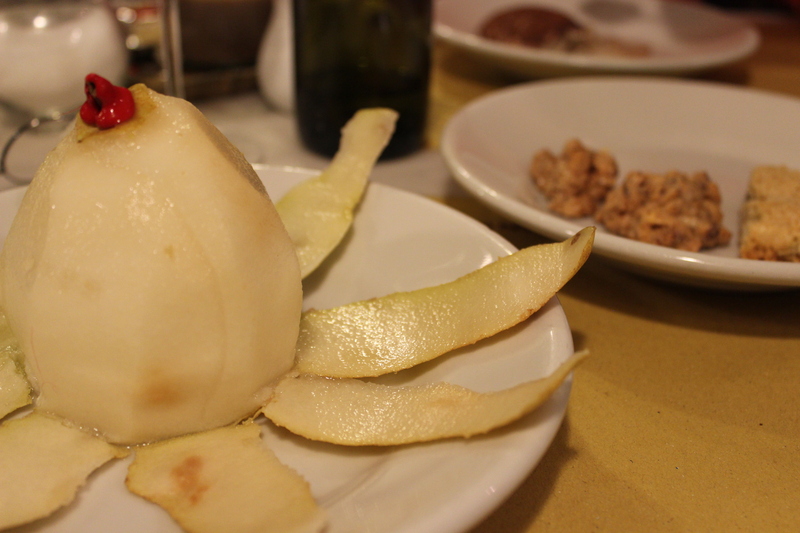 This is often my dessert at home: frutta di stagione, and I was thrilled to have a delicious juicy pear with a few biscotti as a simple dolce. If a juicy pear isn’t enough, you can always choose from one of their homemade tortas.